As science graduates were getting photos taken with friends and family by the Jubilee auditorium, people protesting David Suzuki’s honorary degree gathered at the parking lot nearby with signs and megaphones. 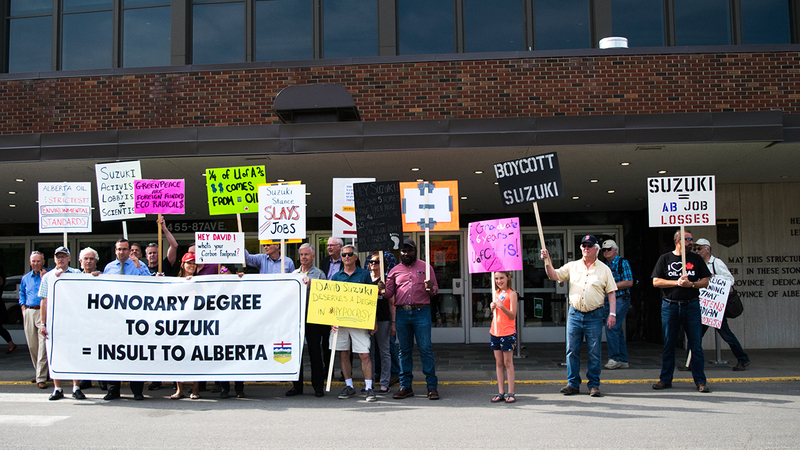 Since the decision to award Suzuki an honorary degree was made in April, the U of A has received backlash from various deans and professors, and from other pro-oil groups who see the move as misguided due to Suzuki’s criticisms of the oil industry. Suzuki was scheduled to receive his honorary degree this morning at 10 a.m.
One protestor, Brian McBeath from Calgary, said he came to the protest to return his Bachelor of Science degree back to the U of A.
James Robson, an organizer from Canada Action, said the protest is a way to hold Suzuki accountable, saying that while Suzuki has warned about the dangers of climate change, the scientist has failed to minimize his own carbon footprint. “This is a man who owns multiple houses, flies around the world, espousing the sensation of hydrocarbons, but he consumes them on an absolutely enormous level”, Robson said. 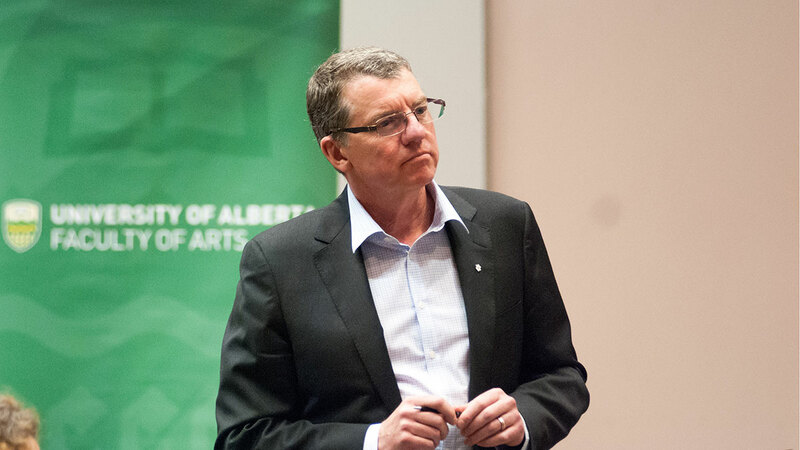 Robson added that while the U of A is free to award Suzuki the honorary degree, he said their actions have consequences and that the donors who have ended their contributions to the U of A over the decision are a sign of those consequences. However, the anti-Suzuki protestors were not the only demonstrators at the Jubilee parking lot as members of the Edmonton Raging Grannies group, and First Nations Elder Taz Bouchier, were present to stage a counter-protest. 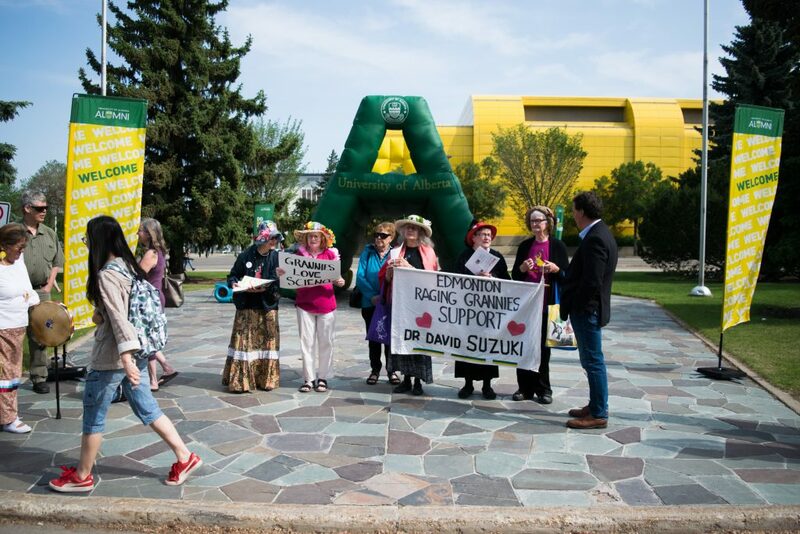 Marilyn Gaa, a member of the Raging Grannies, said Suzuki deserves the honorary degree for his contributions to science communication and that the group believes in transitioning to more renewable forms of energy than using fossil fuels. 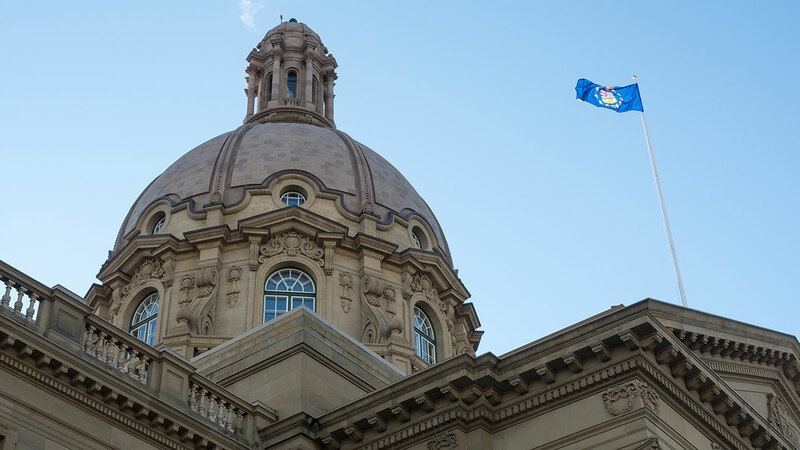 “We’re not saying turn off the taps, we’re not saying let’s throw everybody on the welfare lines, but we’re saying that we need to invest in the future, and we have tremendous respect for David Suzuki,” Gaa said. 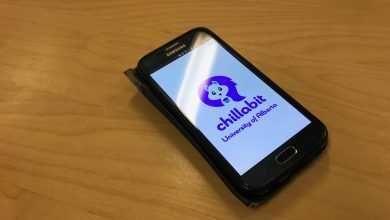 As for the students graduating today, some had no idea what the protest was about, while others paid little attention to it as they proceeded to convocation. 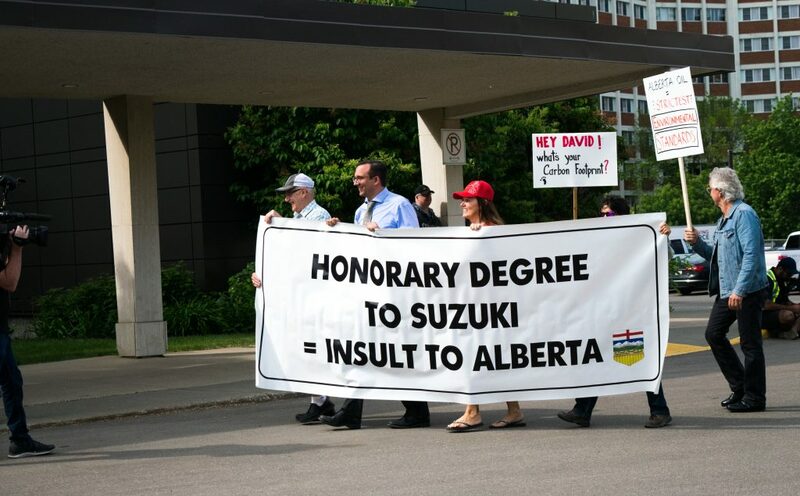 While the protest was occurring outside the Jubilee auditorium, university Chancellor Douglas Stollery awarded Suzuki his honorary degree. 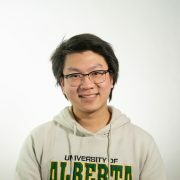 Suzuki proceeded to deliver a speech where he said that it was his brief time at the U of A as an assistant professor that led to his interest in science and science broadcasting. 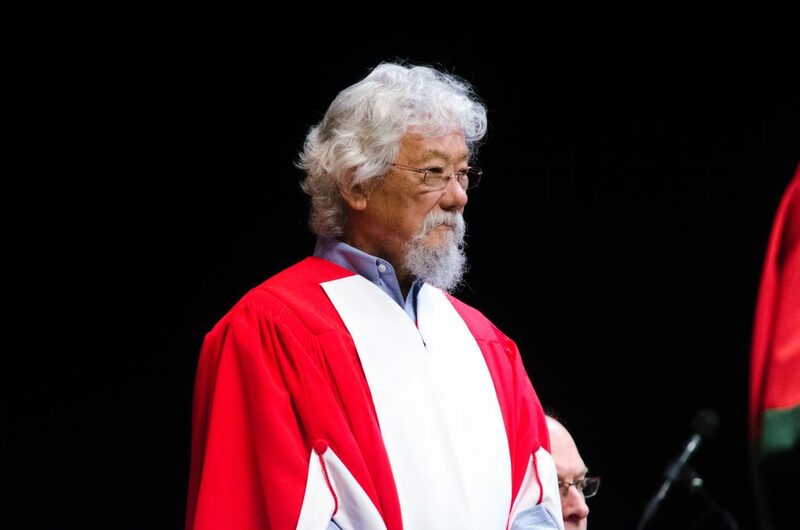 Minutes before, Suzuki was introduced to the stage by Dean of Science Jonathan Schaeffer, who praised his work in science broadcasting and the long-running shows he’s worked on. Some of those programs include The Nature of Things, which Suzuki has hosted since 1979, as well as the radio program Quirks and Quarks, which was first hosted by Suzuki in 1975. 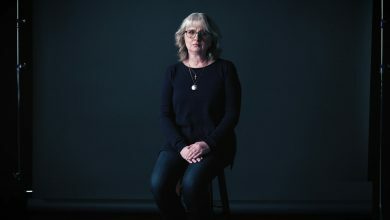 “The Nature of Things is one of the most successful series in the history of Canadian television, and to many people, certainly my generation, Quirks and Quarks and The Nature of Things are why we are scientists today,” Schaeffer said.